Beast Kingdom introduces the D-Select series, which allows you to put together the Disney diorama of your dreams, and recreates classic movie characters and scenes with expert professional techniques. From the character's expression to minute scenes details, the D-Select series provides collectors with a detailed, exquisite addition to their collection. Need something to heal your soul? Beast Kingdom will send Baymax from Big Hero 6 to take care of you! 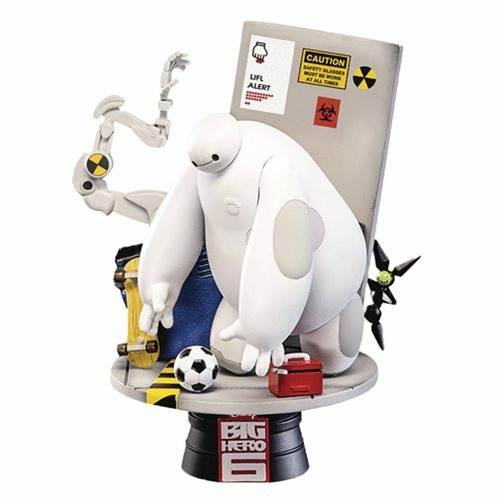 Big Hero 6 D-Select Series DS-003 6-Inch Statue - Previews Exclusive recreates the scene from Big Hero 6 where Baymax chases a ball. This 6-inch diorama draws on elements of the lab from the movie. From the old concrete walls, to the mechanical arm, to the toolbox, to warnings on the walls and floor, everything is recreated in detail from the movie. This diorama is also hiding a secret: a Megabot hiding behind the walls. Its innocent smile will make you happy about the level of detail! Even the specially designed platform and logo tag will give you a pleasant surprise. Ages 15 and up.